Brian Kenny 2004 — Hill of Beath Hawthorn F.C. 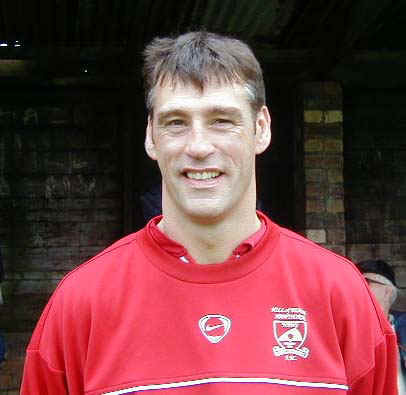 Brian Kenny played 571 games for Hill Of Beath Hawthorn and scored 61 goals. His honours list with the Haws is like many who played with him throughout the 1990's, very impressive. 6 Fife League Championship medals in 89, 94, 95, 96, 98 & 2000, a Scottish Cup winners medal in 1990 and both the Fife & Lothians Cup and Fife & Tayside Cup in 1996. There are numerous other local cup winners medals and invitation tournament prizes also logged under the Brian Kenny roll of honour. The 'Haws' select that appeared to honour Brian included former 'famous-five' team-mates David Westwood, John Mitchell, Bruce Deas and Russell Brebner. Other former Haws favourites who turned out were Bobby Wilson, Willie Syme, Alan Archibald, Steve McInroy and James 'Nobby' McNab. Their opponents were Celtic U19's with Head of Youth Development and Scotland manager Tommy Burns marshalling them throughout the ninety minutes. The match ended in a creditable 2 - 2 draw. After the match, Brian, his family, supporters, both teams and the Haws committee all attended a presentation in honour of Brian's dedication and loyalty at Hill Of Beath Ex-Servicemens club. Tommy Burns presents Brian with a Celtic shirt signed by both teams and the match officials. Long time friend and team mate John Mitchell with a few words for Brian.